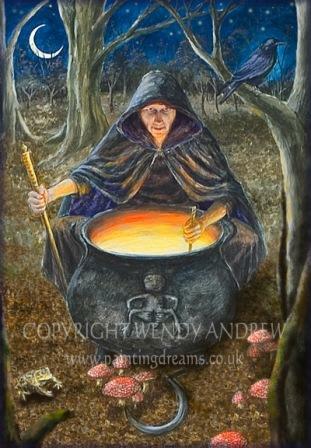 Yesterday was is the Pagan festival of Samhain (pronounced ‘sow-wain’) , this is one of the eight major Neopagan festivals and is considered to be New Years’ Eve by many Pagans. Due to the festivals’ significance to the pre-Christian peoples of north-western Europe it was Christianised as All Hallows Eve, later abbreviated to Hallow’een/Halloween. Many of the popular Halloween traditions observed today have their origins in ancient Pagan practices. 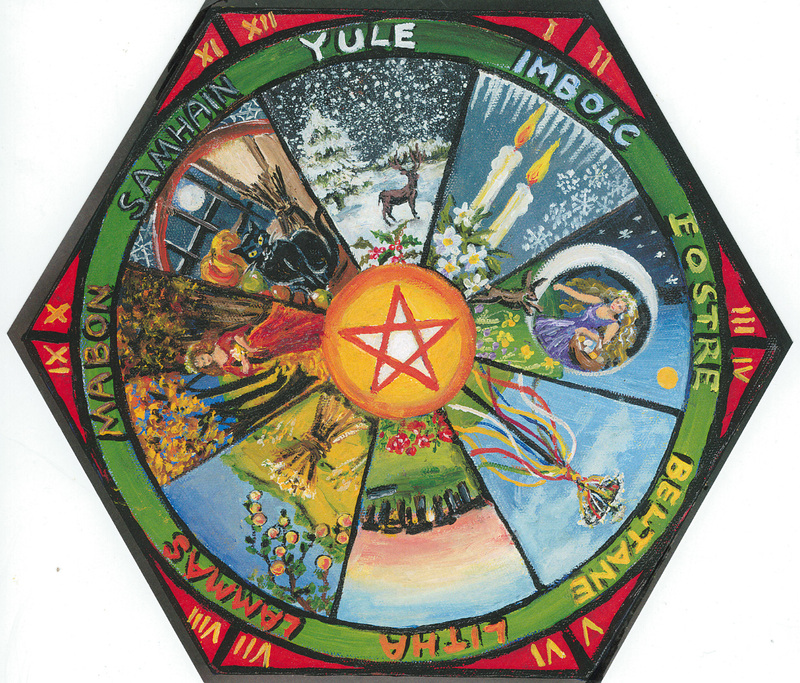 The significance of Samhain must be understood in terms of the Wheel of the Year. In the Neopagan cosmology the Horned God is a Solar deity who undergoes a birth-death-rebirth journey every year. 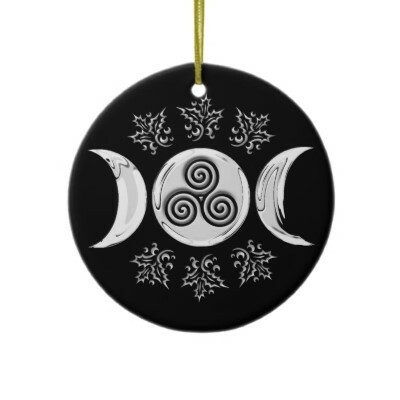 The Triple Goddess represents Mother Earth (as well as the Moon), transforming through Her Maid, Mother and Crone aspects with the progress of the seasons . Together the Triple Goddess and the Horned God in their joint journey provide the mythological basis for the changing of the seasons. At Midwinter the Horned God is born, and the Goddess is renewed as the Maid, by the spring the Horned God has matured to be the Young Hunter pursuing the Maiden Goddess, at Midsummer the Goddess and God are lovers, the Goddess is pregnant with the bounty of summer and the God is in his prime. In the autumn the God transfers his strength and virility to the ripening harvests, whilst the Goddess transforms into Her Crone aspect. At Samhain the Horned God’s strength is spent and He dies, passing on to travel the underworld until He is reborn again at Yule. 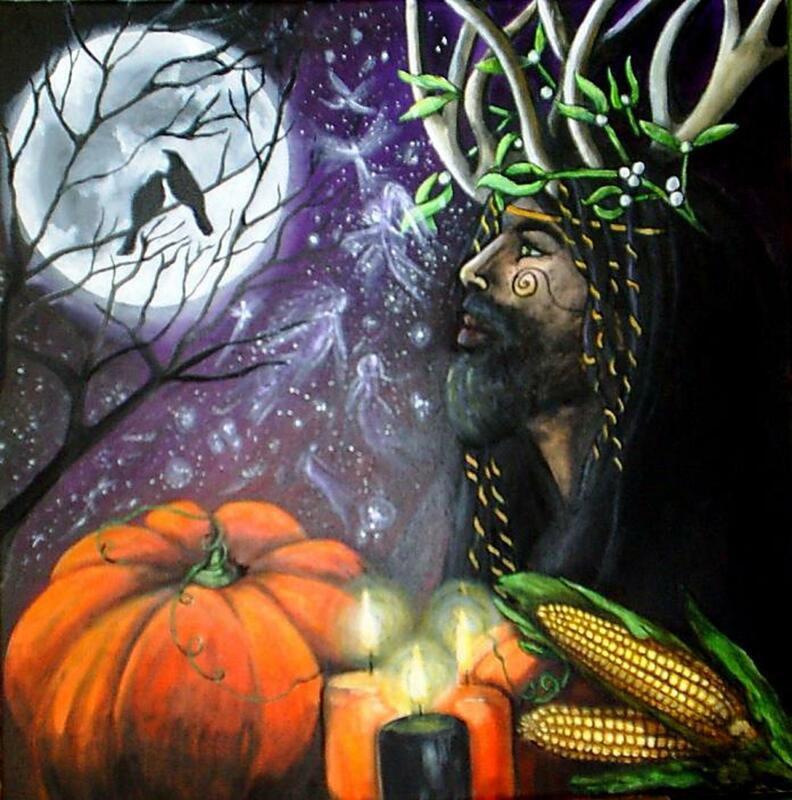 As such Samhain represents the death of the Horned God, the end of the Year, the end of the Summer bounty and Harvest and ritual preparation for the descent into the cold dark of Winter. The death of the Horned God gives the day its association with the dead, it is the day at which the veil that divides this world from the other-worlds is at its thinnest. Traditionally it was believed that spirits of the dead and otherworldly entities would walk abroad. Many Halloween traditions were originally directed at tricking or appeasing these entities, wearing disguises and collecting communal offerings have gradually transformed into trick or treating. It is possible that these practices are part of the folk memory stemming from the distant past when Pagan priests and priestesses would have been dressed as deities and represented them on Earth, receiving offerings and sacrifices in thanks for the years’ bounty and in promise for the return of the Sun the following year. Since the veil between worlds is so frail this is the ideal time for practising divination, which was often done communally and evolved into practices like apple bobbing. To me the significance of Samhain rests in its main spiritual aspect – the descent into the Underworld. 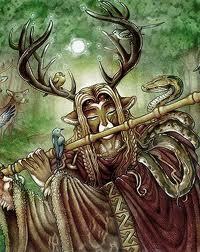 The Horned God has a great many aspects, included in these is the Lord of the Underworld. The Pagan Underworld is not the same as Christian Hell, it is the abode of the Dead and the realm of the ancestors. However, it is neither limbo nor a realm of suffering, it is more a repository of spiritual history and wisdom, the place where deep and ancient knowledge can be obtained. In His role as the Lord of the Underworld the Horned God plays the role of psychopomp (guiding the spirits of the dead to their spiritual resting place), the master/teacher of arcane wisdom and the holder of knowledge that is by its nature a mystery to living. The Triple Goddess in Her aspect as the Crone represents much the same thing. Both deities can be appealed to for assistance and wisdom throughout the year however their winter aspects lend a harder edge to their personas. Winter and death represent literally and symbolically the subject of destruction and endings, this can be frightening and has ‘dark’ associations though there is no element of evil involved. I find myself drawn to the unknown and unknowable and have a love for autumn and Samhain in particular. There are ritual formulas for observing Samhain, usually involving the lighting of a bonfire as at Beltane, communing with the ancestors and divining the coming year. 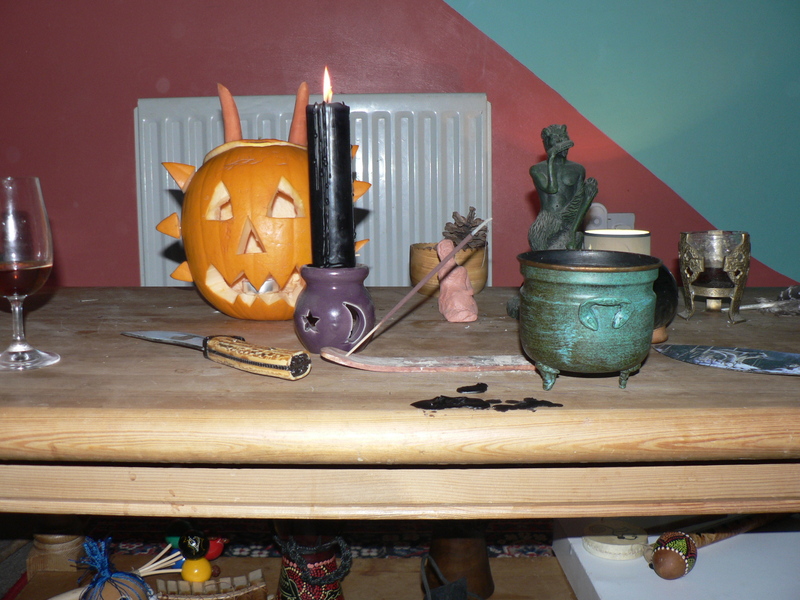 This year we took a relaxed approach to our celebration, we carved a pumpkin and bought sweets for the local trick-or-treaters, when they had finished their rounds we set up our altar and circle with each of the four elements and representations of the Horned God and Goddess, sealed the room and cast our circle in the same manner we always do. We gave our thanks to our ancestors known and unknown for all that they have done and given and poured an offering of mead in their honour. With the formalities over we could have done a vision quest or journey, engaged in shamanic drumming or divination but instead we chose to start working our staffs. Reikiheidi had gathered a number of fallen branches over the past months with the intention of working them into ritual/magickal tools such as staffs and wands. We felt that Samhain would be a nice time to cut them to size, whittle away unwanted pieces and sand them down. This is the first time we had worked wood with ritual intention and we both found the exercise to be very calming and engaging, like any activity that requires full attention it has meditative qualities, and the satisfaction of seeing the item take form. 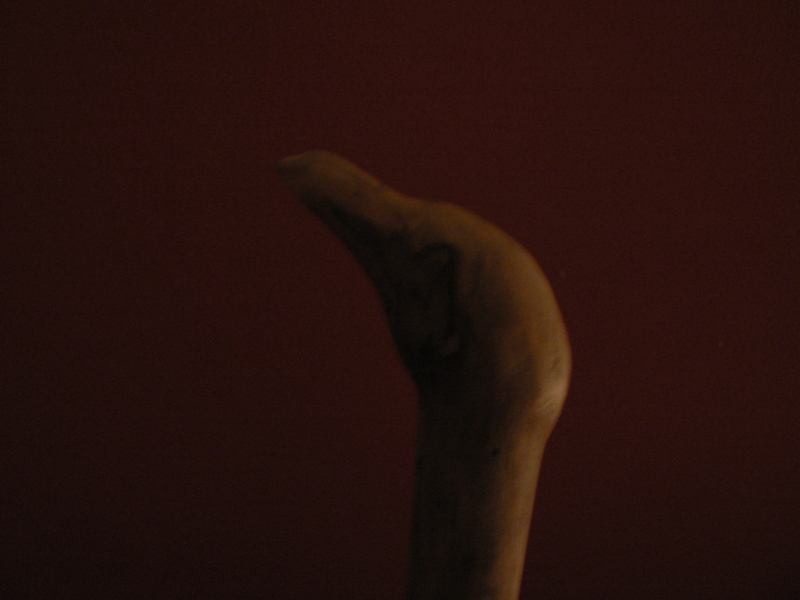 I had not intended to do anything specific but whilst whittling away at my staff I found myself carving the top of my staff into the head of an eagle (one of my power animals). We ended the evening and the ritual with a meal. It was a relaxed and understated evening, we both enjoyed ourselves and gave our thanks for an exciting and interesting past year which was full of change and growth and are looking forward to what the new year has to bring. From the written record of human history several thousand different deities have been identified. Some you will have heard of many more you will not. Until a few years ago I would have called myself an atheist. I have now come to believe in the existence of the divine, I have my Gods to whom I connect with as often as I can. If I am prepared to acknowledge the existence of any given God, can I rationally deny the existence of any other? Some belief systems maintain that there is only one God or pantheon Gods and Goddesses, mine does not. How then should I regard my relationship to these other deities? If the spiritual and divine realms do indeed reflect the material world, then there is scope for myriad forms of spiritual beings and deities. 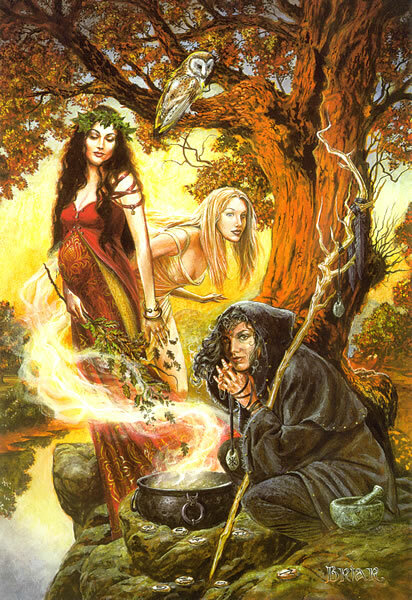 Many ancient pagan religions revered Gods and Goddesses under their different aspects, the Triple Goddess of neopaganism has the Maid, Mother and Crone aspects. This triple aspect feature is common among pagan deities and similar to the Christian Holy Trinity. Despite acknowledging multiple deities with multiple aspects I still consider myself a monist, that is the belief that all existence essentially comprises a single reality. That is a single divine reality, manifesting the physical universe, the spiritual realms, the soul of each individual and the Gods themselves; it has been variously called the Tao, Logos and Brahman among many other names. It seems to me that the nature of reality and therefore the divine is holographic, meaning that each part contains within it the entirety of the whole. Normally when each of us encounters the divine we see one (or more) of its many faces. The face we see differs from person to person and culture to culture, whether or not we see that which we expect to see or whether the divine presents a face which is most appropriate to the time, place and expectations of the observer I could not say. Whoever we are and whatever Gods we call upon, it is the same divinity that gazes back at us all. This is not to say that Yahweh is identical to Odin, or that Zeus and Shiva are the same. 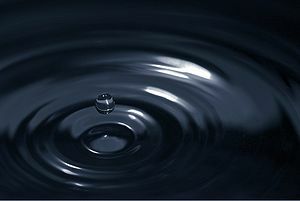 They possess different personalities and attributes, potentially different spheres of influence and powers. They are all manifestations of the divine reality in the same way that each person is a different manifestation of the same ultimate divinity. It has long been the goal of the wise to know the divine reality directly, it is agreed by those mystics that have experienced it that the divine is unknowable except through direct contact and practices such as Yoga and meditation. The Gods in the various forms in which they recognised are more accessible – perhaps that is part of their purpose, perhaps not – through prayer, Shamanism, meditation etc. Whilst Brahman cannot be understood except by the most elevated, the Gods represent a more discernible face that people can to connect to. If this represents intention on the part of the Gods, or whether we have evolved to be able to interpret the Gods in a way which makes sense to us I do not know. That many if not most of the Gods are anthropomorphised to some extent suggests to me the latter. Some people may feel that this belief in some way diminishes the Gods, from being absolute in and of themselves. However this misunderstands the nature of the Great Hologram, since each part contains the entirety of the whole, each deity is no less than the entirety of reality; as incidentally are each of us as individuals. As the Hindu Vedanta philosophy says There is only Brahman. I feel this idea accounts for the diversity of human experiences of the divine whilst maintaining the principle that we (people, nature and Gods) are all essentially one and the same infinite and divine essence. This vision of reality serves as the basis of a flexible, tolerant and all inclusive belief system, it allows me to rationally follow my chosen Gods whilst still aiming for the realisation of the understanding that I am one with Brahman. Does this conflict or fit with your own beliefs?